For decades Wild Turkey has suffered from an undeserved rough reputation. Most businesses might consider that a serious problem – one best addressed with careful PR and possible rebranding. I’m not sure how talks in the boardroom of Austin, Nichols & Co. went, or Pernod Ricard, or even Campari for that matter, but I can tell you how the Russells addressed it. Regardless of ownership they kept making (and continue to make) quality bourbon and rye whiskey. Reputation be damned, they stay true to their craft, respect their consumers, and in all ways embrace the distinctive label that started it all. Unlike many distilleries that simply hire and fire distillers as needed, Wild Turkey has a family legacy to pass on. It may not be family owned, but it is most certainly family operated. And let’s be honest – when it comes to the Russells, nobody’s sitting around. Jimmy could (and honestly deserves to) be living on beachfront property with his toes in the sand, but instead he gets up each morning and goes to work. Eddie carries the same work ethic, and in my opinion is crafting bourbon that rivals some of Jimmy’s finest. And now a third generation is learning the ropes. Brand Ambassador Bruce Russell, who is based in Austin, TX, is spending more time in Lawrenceburg working directly with his father. So let’s stop and take a look at where we’re at today. There’s now three generations of Russells, father to son, actively involved with the production of Kentucky straight bourbon whiskey for the same distillery. How often has that happened? Maybe pre-Prohibition? Someone once joked that before Prohibition there were at least 12 Ripys making whiskey where Wild Turkey Distillery now stands. Of course there’s Beams and Noes, but three paternal generations at the same location producing the same bourbon whiskey together – that truly is a rare occurrence. The torch is passing hand to hand, father to son, and thus the craft stays true. And the timing couldn’t be better, as I genuinely believe we’ve entered a New Golden Age of Wild Turkey. How does one define a Golden Age? Some sources state a Golden Age is “a period of great happiness, prosperity, and achievement,” while other sources describe it as “a period when a specified art, skill, or activity is at its peak.” So let’s take both of these definitions and apply them to Wild Turkey. As much as enthusiasts love Glut-Era Wild Turkey (1979-1991), it most certainly wasn’t a prosperous time for the brand (or bourbon in general). One could argue there was achievement in navigating the storm. While commendable, survival isn’t a trait of a Golden Age so let’s go ahead and scratch that era off the list. And while we’re at it let’s also take the Early Years (1942-1966) off the table as well. The majority of this era’s bourbon was sourced from various Kentucky distilleries, and the rye from Maryland and Pennsylvania. While Wild Turkey was no doubt a successful and growing brand, I wouldn’t consider that time period a Golden Age by definition. How about the years when Jimmy Russell first took the reins (1967-1978)? From all accounts there was happiness, prosperity, and achievement. Jimmy was in his prime and the bourbon whiskey being produced at that time is considered by many enthusiasts second to none. There was innovation with the creation of new expressions like Wild Turkey 86.8 and 80-proof KSBW, Wild Turkey Liqueur (now American Honey), as well as the introduction of collectible ceramic decanters. This period fits our definition and is unquestionably a top candidate for a Golden Age. Now let’s take a look at the Post-Glut era (1992-1998), or what I consider a Turkey Renaissance. By this time Eddie Russell had been on board for over a decade, though Jimmy was still very much in charge. The Glut Era was ending and new products were coming out of the distillery almost every other year. The 1990’s saw the introduction of Rare Breed, Kentucky Spirit, Kentucky Legend, and the continuance of WT 101 12-year with the “Split Label.” Two of these products, Rare Breed and Kentucky Spirit, would eventually become core expressions. The export variety increased as well in the 1990’s with WT 101/12 Cuvee LaFayette, 1855, Tradition, and an exclusive version of Kentucky Legend. With so much moving in a positive direction, one might consider this time period a Golden Age. I don’t think so, but let’s keep moving and we’ll revisit my reasons later. The years following the 1990’s are what I’d label as Transitional Years for Wild Turkey (1999-2006). Logos and core expression labels were redesigned after decades of use. The revered WT 101 12-year expression became export-only. New products, like Russell’s Reserve 10-year were introduced and then quickly reintroduced at a lower proof. Rare Breed stopped becoming a unique annual batch; bottling moved from KY to IN, then later IN to AR; barrel entry proof changed – not once, but twice; and product consistency was arguably askew. While there were notable releases throughout this time period, there’s far too much change and apparent uncertainty to classify these years as golden by any stretch of the definition. I’ll now use the word “modern” loosely, as modern is a descriptor used in relation to anything remotely in the present. It’ll work for now, but some years down the road (should this article still exist), one should revise the discussion that follows appropriately. Let’s talk about modern Wild Turkey (2007-2014). I’m going to split this era into two periods: the Early-Modern and the Late-Modern Years. In general, the Early-Modern Years are distinguished as the final years of ownership under Pernod Ricard (2007-2009). While new releases like Russell’s Reserve 6-year Rye and LE’s like Tradition were trickling out, the overall Wild Turkey bourbon profile was beginning to change. Russell’s Reserve 10-year was no longer the dusty-esque 101/12-like pour it had been. WT 101 was losing some of its classic mustiness, as was Rare Breed. And Kentucky Spirit, while still an amazing single barrel KSBW, wasn’t exactly the same as its 1990’s and early 2000’s releases. The profile changes were likely a combination of many factors, but as for the overall business direction I’m curious if Pernod knew what was coming and simply started coasting. Regardless, by mid-2009 Gruppo Campari had taken over, and despite what anyone tells you, it was a damn good thing for Wild Turkey. The Late-Modern Years (2010-2014) saw new life breathed into Wild Turkey thanks to focussed creative efforts by both Campari and the Russells. In fact, the wheels really started turning in a very short time. By 2011, a brand new state-of-the-art distillery was fully operational and revised logos/labels for several core expressions started rolling out. In 2013, Russell’s Reserve Single Barrel debuted with a private barrel selection program following closely behind. 2014 saw two major events: the grand opening of a new Wild Turkey Visitors Center and Jimmy Russell’s 60th Anniversary (marked by a special bourbon release, of course). Overall, the Late-Modern Years brought quick change – positive change – and with that the stage was set for what I believe are the best years Wild Turkey would see in decades. Before I begin discussing the times we’re in now, I want to circle back and nail down my definitive Golden Age of Wild Turkey. For me that would be the Pre-Glut years when Jimmy was first designated as Master Distiller (1967-1978). Yes, the Post-Glut 1990’s, or what I call the Turkey Renaissance, is a potential candidate for a Golden Age; the problem is, things were still shaky coming out of the Glut Era. The venerable 8-year age statement for Wild Turkey 101 was dropped domestically in exchange for the infamous “Old No. 8” label and exports were seemingly getting more attention. It just can’t compare to the late 60’s and early 70’s when Austin, Nichols realized what Jimmy was doing in Lawrenceburg was magical. So much so they purchased the Boulevard Distillery itself – establishing it as the only source for Wild Turkey Kentucky straight bourbon whiskey and rye. Those few years and the years just prior to the Glut Era were surely the definitive Golden Age of Wild Turkey. Looking back on the last three years up to today I’ll have to admit, Wild Turkey is performing incredibly well (and I’m not just talking financially). While prosperous and contributing to the overall growth of the Campari Group, it’s much larger than that. The creativity, craft, dedication, and most importantly, the attitude is unrivaled at its present level by any other Kentucky distillery. Everything seems to be moving in the right direction, with the right timing, and with the promise of better things to come. Let’s start with looking back at 2015. First and foremost, Eddie Russell was officially named Master Distiller. It was a title well-earned after many years of service under his father, Jimmy Russell. And in case you haven’t figured it out by now, Jimmy’s not stepping down anytime soon. Speaking of Russells, 2015 saw the addition of Eddie’s son Bruce as a brand ambassador. Outside of personnel changes, logos and labels for a vast majority of the core expressions were completely redesigned. As for new releases there were two limited editions, Master’s Keep 17-year and Russell’s Reserve 1998, as well as a new ultra-premium core expression, Russell’s Reserve Single Barrel Rye. Each of these releases were very well-received. In fact, many enthusiasts regard Russell’s Reserve 1998 as one of the greatest Wild Turkey expressions ever bottled. 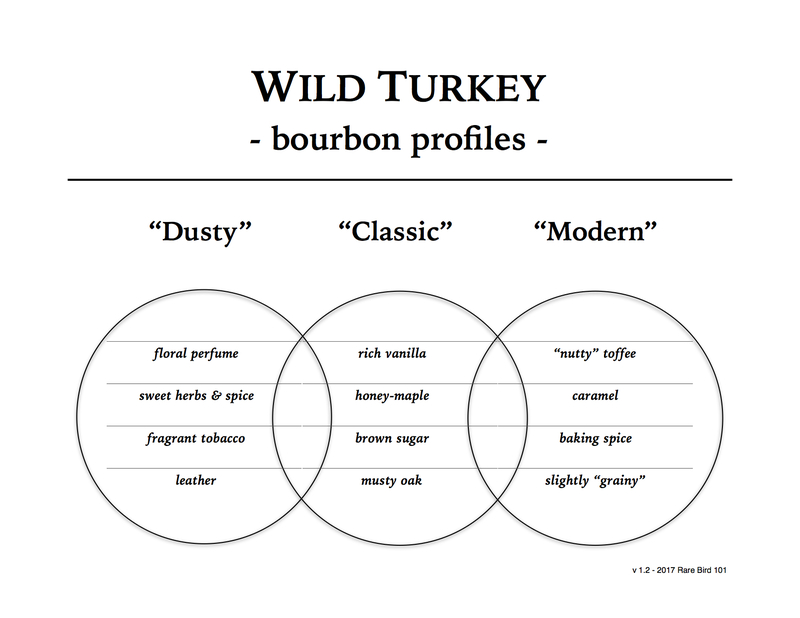 By 2016 Wild Turkey had gathered considerable steam. The private barrel selection program was growing increasingly popular among vendors and enthusiasts. Whiskey consumers that traditionally passed on the brand’s offerings were taking note and branching out. And then – just when you thought things might be settling down – Matthew McConaughey was welcomed to the Wild Turkey family as Creative Director. This was no run-of-the-mill spokesman job. No sir. From the release of his first promotional video it was apparent this relationship was the start of something far greater – something genuine and unique. In the blink of an eye 2017 was here and brought with it two memorable releases: Master’s Keep Decades and a new Rare Breed batch (116.8). Decades may be the most artfully-crafted limited edition whiskey ever released by Wild Turkey. Sure, it’s hard to measure up to fan favorites like Tribute and American Spirit, but that’s not what I’m saying. What makes Decades so special is it’s a “concept album bourbon.” Eddie skillfully married his own profile preferences and Jimmy’s profile preferences into a single bourbon aged 10-20 years. And it works … beautifully. It’s small-batch blending at its finest and evidence that all the years – yes, decades – of tutelage under Jimmy paid off. In essence, Decades is the real Wild Turkey Tribute and I think a lot of folks missed that subtlety. As for 2017’s Rare Breed, fans disappointed in batch 112.8 [raises hand] were treated to a notable step up in quality, as well as a new bottle and label design with batch 116.8. And Rare Breed wasn’t the only expression experiencing an uptick in profile complexity. Both Wild Turkey 101 and 101 Rye were each consistently impressive by the batch. Perhaps the 6-year whiskey distilled at the new facility in 2011 was finally strutting its stuff? Hard to say, but something was definitely clicking in 2017. And now here we are in 2018. Longbranch, Matthew McConaughey and Eddie Russell’s highly-anticipated Wild Turkey collaboration, launched just days ago. It may not be every diehard bourbon enthusiast’s dream release, but I’d imagine it’s going to give its competition like Basil Hayden’s and Gentleman Jack one hell of a Texas-sized bullfight. Time will tell, but my bet’s on Longbranch. As for what else is to come, well there’s Master’s Keep Revival and Russell’s Reserve 2002. Revival is essentially Wild Turkey 101/12 finished in Oloroso Sherry barrels (yeah, that sounds delicious). 2002 appears to be the sequel to Russell’s Reserve 1998. If it’s anything near 1998 in profile, get ready for a stellar straight bourbon whiskey! Folks, we are without question living in a New Golden Age of Wild Turkey. Enthusiasts exploring the brand now have more variety to choose from than any generation before it. There’s truly something for everyone. As for you old-school enthusiasts stuck on dusty expressions, take a few minutes and put the “forward-facing turkey” bottle back in the cabinet. Drive to your local and pick-up a Russell’s Reserve Single Barrel private selection. Take a chance on Decades or the 17-year Master’s Keep (if you can find them). Hell, grab a new pint of 101 or a fifth of 101 Rye and pop the cork with an open mind. Yes, dusty Turkey is phenomenal but it’s a dying breed. Give today’s Wild Turkey a fair chance and I’m confident that everything I’m saying will in short time make perfect sense. As for the future, we have a lot to look forward to – both short-term and long-term. From a reported 101st anniversary release celebrating the combined years of service of Jimmy and Eddie Russell, to rumors of a possible collectible decanter (yes, you read that correctly). We also get to find out how well-aged whiskey from the new distillery performs, and that’s something a whiskey nerd like me lives for. And looking long-term, Bruce Russell may just be the next Master Distiller of Wild Turkey. He comes from a different generation – open to experimentation and modern trends. At the same time, he’s cut from the same cloth as his father and grandfather. He understands the foundation of his brand: the hard-working customers buying handles of 101 every other week. From all I’ve seen, Bruce seems to have an excellent understanding of what makes Wild Turkey, well, Wild Turkey, and that’s something you can’t create artificially. Yes, I’d say Wild Turkey is in good hands – has been since 1954 when Jimmy first started. Oh, and that rough reputation endured for so long … I say give it the bird. At the rate things are going, it’s finally looking like the joke’s on it. Bring it on. Wonder what the Russell’s 2002 will retail for. The bottle count appears to be considerably low. I’d expect $200-$300 and would be very surprised if less. Unfortunately, there will be folks buying to flip instead of sip, which retailers often pick up on. Stay loyal and close to your local! That’s about the range I suspected. Crossing my fingers my local even gets a bottle! What a great article! This Brand is doing everything right by not changing a thing. Just let the Russells continue running things! p.s. Met Jimmy R. at 2018 Kentucky Whisky festival in Bardstown. What a great guy, and what a great legend of a Bourbon Distiller! Thanks so much, Scott. I really appreciate the feedback.